*Sincere thanks to LB and the Baddish Group for the sample. It would probably not be considered going too far out on a limb to say that Four Roses‘ history is one of the murkiest and most confusing in the world of whisk(e)y. Interestingly, it should also be noted that, today, the distillery and brand is among the most transparent in the Bourbon world at least…but that’s today. In the past, there have been times when Four Roses themselves have presented different versions of some story…and for no other reason than no one was really sure what the true story really was. A couple of years ago, I touched on the several stories floating around about the origin of the name Four Roses. While that was fun and all, this time around, I thought I’d take a look at why Four Roses fell off the face of the United States for a few decades, and how the brand, like a phoenix of yore, has risen once again, landing pretty much at the top of the heap. We’ll fast forward to 1943, past the murky tales regarding when the brand was founded (either in the 1860’s by Rufus Rose and probably his brother and two nephews, or possibly in 1888 when, according the brand’s website, a man named Paul Jones legally trademarked the name of a popular whiskey that had…been…around…since…the…1860’s) to when Seagrams bought the company, then known as the Frankfort Distilling Co. I’d be remiss if I didn’t mention that an alternate story goes that Rufus Rose’s Four Roses was purchased by the original Joseph Seagram & Sons in 1913, and, in turn, that company was then purchased by Sam Bronfman and his company Distillers Corporation, LTD. in 1928. Whatever…in any case, the year is 1943, and Four Roses bourbon, one of the best-selling bourbons in the country is now owned by Seagrams, one of the biggest distillers in the world. Seagrams had done well since Prohibition ended, they had presaged the country’s shift in taste to lighter, blended whiskies, and marketed their products successfully to drive demand even higher. In a somewhat dubious move, however, Seagrams decided to stop selling this top-selling bourbon in the U.S. and instead send all the Kentucky-made bourbon to the European and Asian markets. Yes, the brand was already big overseas, and yes, this renewed focus helped it not just survive the big increase in demand, but become the biggest-selling bourbon in the Asian market, but still, a somewhat strange move. Here in the States, Four Roses now soldiered on as an inexpensive blended whisky. Initially, this blended version of Four Roses was probably not the horrible whisky it reportedly became, but as the years went on, the quality apparently plummeted and Four Roses the blended became synonymous with “rotgut” and “skid-row”. The crazy thing is that while the brand was being run into the ground in the U.S. with whiskey made in Indiana, the brand’s old distillery in Kentucky was still cranking out excellent bourbon to be sold overseas. It may seem odd that Seagrams just shrugged its shoulders and abandoned a once very successful brand in the U.S., but then again Seagrams, on occasion, has made some, shall we say, poor business decisions. By the late 90’s, the once mighty Seagrams had over-extended itself, watered down its wine & spirits brands, and ultimately fell apart in several directions with Pernod-Ricard and Diageo taking control of its beverage division. In 2002, Diageo sold the Four Roses brand and distillery to the Japanese beverage giant, Kirin, who ultimately recognized the potential for Four Roses bourbon in the U.S. market, and did the right thing by giving us back this storied brand. No small amount of credit for this belongs to Master Distiller, Jim Rutledge, who for years pushed Seagrams to sell the Four Roses bourbon in the states, or at the very least, make it available to the very people who made it. When Kirin took the reigns, Rutledge’s pleas were answered, the awful blended whiskey disappeared and Four Roses began its long march back up to the top of the aforementioned bourbon heap. Today, Four Roses’ excellent core range is represented in the U.S. by the Yellow Label, the Small Batch, and the Single Barrel. There are still two expressions exclusive to the Japanese market, the Platinum and the Fine Old. Their yearly Limited Edition Single Barrel and Small Batch releases are always a highly thought-of and highly sought-after bottles. While all three of the core expressions are very reasonably priced, the Yellow Label is the most inexpensive, at around $16-$20. Approximately six years old, this rather “vintage-y” labeled whiskey is a blend of the ten different bourbons Four Roses produces using their innovative combinations of five yeast strains and two mashbills. They are able to further broaden their palate, the Yellow Label in particular, by blending different ages of these different recipes. No other bourbon distillery gives itself this much variety to work with, certainly not when it comes to their entry-level expressions. The Nose: A very solid, bright bourbon nose. Warm caramel apples with orange blossom honey and a little vanilla bean paste. There are subtle but nice rye notes – think lightly toasted rye bread. Slightly woody spice notes of warm, bright cinnamon, a bit of clove and black pepper. Further back, touches of sweet corn ice cream, and slight hints of fennel and orange-tinted bittersweet chocolate. A slight whiff of solvent gives away the lower price point of this one. The Palate: Spicy, somewhat hot, and quite sweet initially with burnt toffee, juicy orange, and a bit of watery orgeat syrup. The rye is less subtle than on the nose, but also a bit more raw and green. Wood spice notes of rough cinnamon, nutmeg, black pepper and a hint of anise seed. A bit of that solvent-y heat, slightly harsh and rough-edged touches of barrel char and burnt popcorn lead to the finish. The Finish: Continued burnt popcorn and vanilla sweetness with more woody cinnamon, clove and black pepper. That alcohol heat from the end of the palate lingers bit as well. Thoughts: A very good bourbon for the money. It’s fairly easy for me to find Four Roses Yellow Label for under $20. Hell, I can occasionally find a 1.75l handle for under $30 bucks. 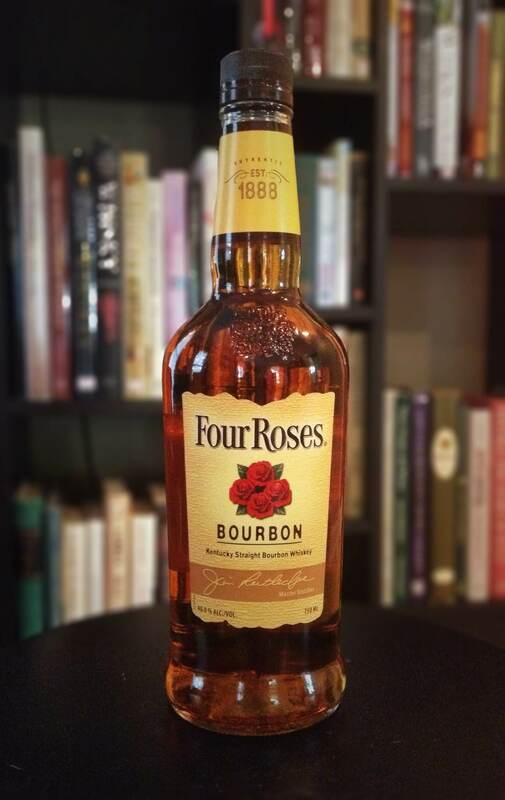 Though the flavor profile is fairly basic and straightforward, Four Roses multiple recipe technique gives this more complexity than you usually expect for a bottle in this price range. Outside of those (somewhat expected) youthful, raw edges throughout, there’s little to complain about with this one. It works well in a cocktail with just enough rye to give it depth, and holds its own as an everyday sipper, especially over ice. These days bargains seem to be disappearing in the bourbon world, but for the moment, Four Roses Yellow Label is still one of them. As a solid, everyday value buy, recommended. Good lord, you need to do some fact checking. It’s TWO mashbills and FIVE yeast strains. Actually, I just need to proofread better, but same difference. Thanks for your keen eye. The company was started by Larry Miller’s grandfather in Frankfort Kentucky. Highly successful it was purchased by Seagrears (sp) for big money in the forties.